Categories: Dave Canterbury & The Pathfinder School, Pathfinder Outdoor Survival, Top Sellers. DID YOU KNOW…during daylight hours a signal fire can be seen a lot further away if you can produce the right color smoke? 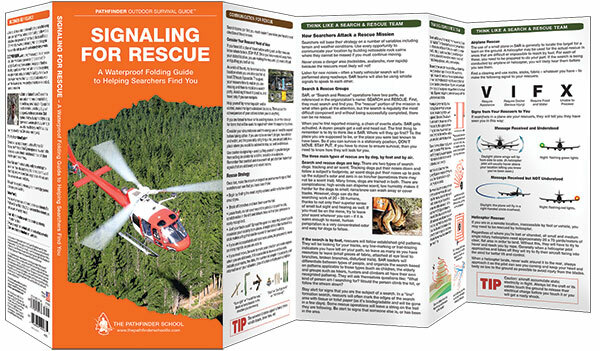 What is crucial to understand before reading this guide is that leaving a good game plan with a loved one before traveling into the wild is a critical step in being rescued. Without this step Search and Rescue (SAR) will not know where to start looking, which can prolong your rescue and the hardships you will have to endure by days or weeks. 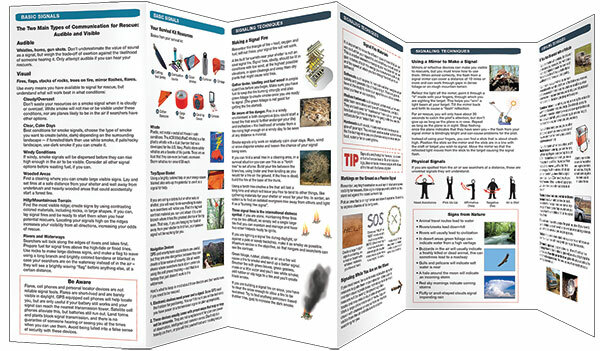 Signaling knowledge is as important for your survival as shelter, fire and water. This waterproof guide will teach you how to be visible through contrast and movement to your rescuers, as well as how to leave clues to be followed if you are on the move. Thinking like a Search-and-Rescue team member might save your life. Developed by noted survival expert and woodsman Dave Canterbury, this is one of a 10-part series on survival skills. Made in the USA.